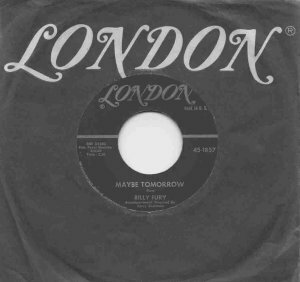 Billy Fury's first single, Maybe Tomorrow, was issued in January 1959. Chris Eley takes up the story. 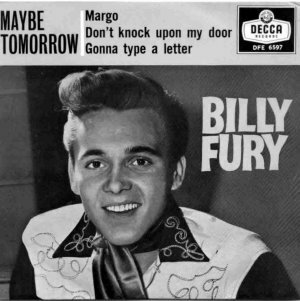 Incredible as it seems, 2009 saw the 50th anniversary of Billy Fury's first chart success with the self-penned single, Maybe Tomorrow. Recorded in November 1958 with matrix number DR 25282 and written whilst Billy was still Ronnie Wycherley, this haunting, wistful paean of heartbreak and teenage angst is one of the favourite tracks of most of Billy’s fans. This is especially true perhaps for the older ones for whom it had some significance in their own lives at the time, be that on a personal level and/or just discovering Billy for the first time. The Musical Director was Harry Robinson and it’s a great pity that he was not interviewed about this auspicious occasion, or not that I know of. Hard to imagine though that when my then pal, Peter Roberts of Trevellas near St Agnes offered me his sister’s records around 1961 that I said: "No thanks" because the ones he played (all of the early ones) did not sound like the Billy I had just discovered in 1961. How stupid was I, because by late 1964 I was desperate to get hold of these singles and of course most were deleted by then. It took me until around 1979 to track down My Christmas Prayer. The recording session sheets don’t actually give the day of the recording in November but it’s clear that the great rocking B-side, Gonna Type A Letter was recorded in December. That was it for 1958. It seems Billy performed it on stage at the Essoldo Theatre on October 1st 1958 but it’s possible that during his appearances in workingmen’s clubs and talent shows before then, that it was also given an airing. According to the NME singles charts the release reached number 26 by February 28th (one magazine report says 27th), and had reached number 22 by 7th March, dropping to 26 by March 14th. It then dropped out of the Top 20, re-entering at 18 by 28th March before disappearing from the Top 20 altogether. Another modern retro source, the one usually more relied upon today, has Billy reaching number 18 on the 27th February as a re-entry, so take your pick. Certainly this lovely track made the number 18 slot whichever way you look at it. An impressive debut for a UK singer/songwriter of only 18 years of age, even if not quite as successful as Russ Hamilton with his own song, We Will Make Love, reaching the No. 2 position in 1957. 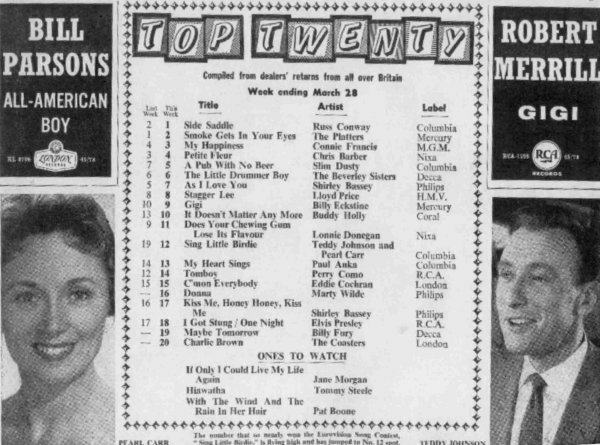 Let us also not forget the supremely talented Marty Wilde reaching the Top 20 with Bad Boy in 1959 or other pre-1960 UK singer/songwriters like Johnny Kidd with gems like Please Don’t Touch. Billy arguably wrote the largest number of self-penned tracks for the time and had single and album hits but contrary to myth was not the only one doing it. There was quite a bit of press coverage of the new star during 1959,mostly featuring Billy in the famous Loving You-type cowboy outfit that he wore on stage, with white shoes. How good it would be to locate a colour shot of him wearing that gear. The single had a USA release, London 1857,where it was reported as having generated some interest, but regrettably failed to chart, the same as the other 12 or so releases on the London label, two on United Artists and several on Mala during the Parlophone years. There was a New Zealand release and although I have not seen it, I assume one in Australia and probably Eire too. Whether these early ones were ever pressed up in the Far East I can only guess – but it’s likely. There were other foreign releases but information as to whether they achieved any chart success is hard to come by. There was a UK 78rpm issue and apart from the tri-centre, also certainly a later round centre, which was deleted around 1963-65, perhaps earlier. Billy performed the number during his TV "acting" debut in Strictly For Sparrows and very likely on Cool For Cats around the same time. In the1990s Decca’s John Tracy, who had been Billy’s flag waver for several years and given us so many great CD releases, had an electronic search made, including the vaults across the Atlantic. As well as finding the stereo takes of the Sound of Fury album, other rarities turned up, including the stereo version of Maybe Tomorrow. When compiling the 40th Anniversary Anthology in 1998 I included that version in the running order and it made me realise once again, just how lovely the number was. The live at the BBC version came my way several years later from a friend and I handed that over to Decca, where they placed it, along with other performances from1959, on the excellent Billy Fury At The BBC double CD. Had the person concerned at Decca at the time followed up my leads the CD would have possibly had more tracks and the person whose foresight had kept the tracks safe since 1959 may just have received the reward he so deserved. Sometimes this is not a nice business at all. I had struggled unsuccessfully for years to get the BBC stuff out and whilst being admittedly disappointed at not actually being able to compile and annotate the set I was happy to bring five or so tracks into the public domain via this release. The version of Maybe Tomorrow on this CD, without the girlie chorus, is perhaps the finest version of all in some ways – sparse and pure Billy. In 1978 Billy recut a version for K-Tel, which despite his illness at the time and the pressure of recording so many tracks, is enjoyable. At least two K-Tel CDs have that title. Then in November 1982, he recorded a beautiful version for ITV’s Greatest Hits programme, the show being actually broadcast after the Unforgettable show. Although looking very frail, Billy looks great and sounds very much like the 18-year-old Billy. It’s perhaps the most moving performance clip we have of him, and never fails to bring back the sheer sadness of the time that it was shown. How I wish I could have been there for the recording of that show and that elsewhere in 1982,when I did see him, he had performed some of his own material, especially this very special number, akin to My Christmas Prayer; so very similar, and also haunting, reflecting the real soul of Billy Fury. 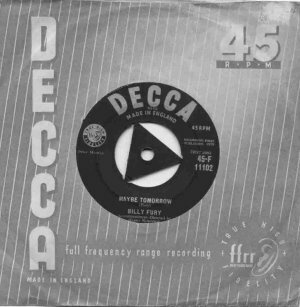 In July 1959 the track featured on Billy’s first EP, which came out triangular and round centred, with orange and yellow covers respectively. It has been rumoured for years that blue and mauve/red covers also came out on later issues but these are more likely to be the Spanish versions in my opinion, never even having a whiff of a sighting of different UK covers. In November 1960 the track featured on the LP Billy Fury and came out again on The Billy Fury Story double LP, released in February 1977, and the Billy Fury Hit Parade LP in April 1982. This was the last hit album Billy would know about, although he would live to enjoy two hit singles. There are of course several CD releases containing the mono and stereo versions of the track, notably the Sound of Fury + 10 and more recent Sound of Fury double CD. When people in the future come to re-evaluate the music of our time, and of Billy Fury in particular, then most surely they will wonder at the talent of perhaps the then UK equivalent of young Ritchie Valens (although Ritchie was a better guitar player of course). A boy who, despite limited guitar-playing ability, could write about teenage heartbreak as well as anyone else at the time, better than most, and then put even more heartbreak and pathos into the recording of those numbers. Flipping to the early B-sides, those future listeners will also discover a rare ability to once again write and perform the beat music of that generation with the best of them. When played really loud, Gonna Type a Letter, so beloved by the 70s rockabilly set that Decca reissued it on a different style and shade blue label as the A-side in 1979, with Maybe Tomorrow as the B-side, is a terrific rocker and promotes further sadness that all in all, Billy’s actual studio recorded rock’n’ roll/rockabilly output was very limited indeed. Perhaps under a dozen numbers, because even some of the ten-inch album tracks were more ballad or country than rock. The single had a French pressing with a light blue solid plastic centre which was readily available in the UK. This may have been done either for French release to its own rockabilly set, and/ or perhaps to supplement UK pressing numbers. 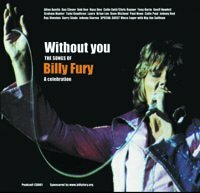 In recent years Johnny Storme, a good Billy and Elvis/60s performer and nice guy, chose this number above all others for the Without You Billy Fury Tribute CD**; and he made a fair fist of it too. More recently guitarist Peter Williams*** has given the track his unique My Voice Is My Guitar treatment, and that is a lovely version, perfectly highlighting its simple beauty. I still prefer the later Billy Fury who turned me onto popular music, but over the years I too, have come to love most of the early tracks that he wrote, and to appreciate the then quite rare song writing talent he had at the beginning. Maybe Tomorrow has poignancy, and a simplicity that few other artists ever get to capture in their entire lifetime – Billy did it with his very first official release and deserved so much more fame and peer regard than he actually received in his lifetime. This feature is reproduced, with kind permission, from the magazine of The Sound Of Fury Ffan Club. By agreement, the magazine's material is not normally republished on billyfury.com until at least one year after it originally appeared in print, but the editor has permitted early reproduction of this feature because of the topicality of the content. **Without You is available for digital download. ***Peter Williams' CD Billy Fury Always Remembered is available through the website peterandsonjawilliams.com. Thanks to Paul Staines for additional scans.